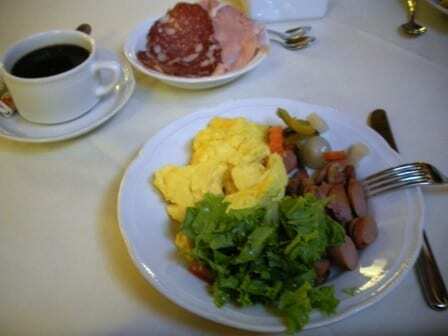 Eggs, salad, meats and coffee…healthy? So we’re sitting down having dinner at the BConnected Conference and we’re talking about the usual amounts of fitness and nutrition wisdom that I try to impart on everyone who will listen and the topic of “eating healthy” comes up. Let’s get one thing straight; everyone eats healthy. Everyone. True? Now most people would agree that you can eat pretty healthy and still be overweight, right? Isn’t it also true that you could be very unhealthy and very slender? The answer is obviously yes. So therefore there is a vast difference between what you look like and how healthy you are internally. This is a big problem for the majority of people out there that think they’re eating “healthy”, which some are, but not eating for success at their fitness goals. 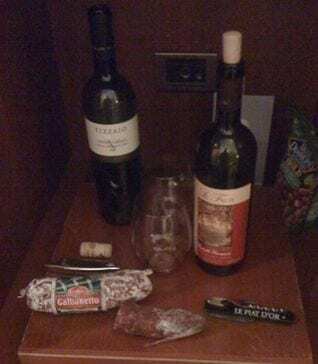 How about wine and salami, healthy? Once you enter into the realm of fitness though, the lines become obscured between health and achieving those fitness goals. Let’s take a closer look at this with an example. Sandy comes in to the gym and she’s about 35% body fat at 185 lbs and wants to lose fat, build some muscle and lean down to about 25% body fat. Nothing wrong about those goals, however, they’re not why Sandy wants to lean down, but for simplicity sake we’ll say she wants to look good on the beach this summer. Roger, got it, driving on. Now a 10% loss in body fat isn’t that much and she can easily lose 18.5 lbs with a little diligence with training and focusing on their diet. Assuming she can burn up to 2 lbs a week of body fat with some resistance training and intense cardio she’ll be able to do this in about 6 weeks. Probably more about 8 weeks, but give or take. You can never tell with absolute certainty in regards to body fat loss as the body is sometimes uncooperative with the process. The problem lies in being able to burn the fat effectively and keep yourself sane at the same time. Body fat loss is easy as long as you can control your hunger and burn off enough calories from that reserve tank (aka those ugly little handlebars on your sides and saddlebags on the thighs). How do we control hunger? By eating all the time. Yeah, that can work. But it depends on what you’re eating. And studies have found that eating all the time is no more productive than eating the average three squares a day. I’m not going to search for these studies, but Google is a readily available service and you can look through all the studies for yourself. All eating several smaller meals does is allow you to CONTROL HUNGER! We also can control hunger by eating lots of protein. Yes, protein helps control hunger, because it digests slow, slows insulin release and helps build and repair muscle tissue. This is very important to “dieters” because you want to sustain muscle mass at all costs, perhaps even build more. Tip #987 Muscle burns calories, more muscle, more calories burned. Thanks, you will be charge $299 at the end of this post. Just kidding, but protein is important. That’s why every diet increases dietary protein. And ladies this means you have to eat more meat proteins, not just double up on your yogurts (which I’ll get into in another post). Another key thing to concentrate on is essential fats. Our body needs these fats to survive and operate at a high level. A good dose of fat will also help burn more fat. Your body is used to burning fat for fuel during non-intense activities. The more fat you add into the diet, the better your body will “learn” to burn fat. This is providing your not flooding the system with a high level of carbohydrates, which I’ve written about in this post. What Are Carbs And Why You Can’t Eat Them! How about water? Water is a key influence in everything our body does, we’re 80% water so having enough water to burn fat and operate at 110% everyday is also important. So drink enough water. Guidelines for water intake will vary, so just shoot to drink at water at every meal, even if you have to add some no calorie drink mixes into it. These can also help curb your hunger responses if you can’t separate the difference between hunger and thirst. Sometimes your body wants water and you think cheeseburger. I don’t know why this happens, but it does. Drink a glass of water before every meal and especially before and after exercise to replace all water lost throughout the day. Now exercise is a key stimulus for weight loss, because all the dieting in the world won’t help you build muscle or sustain a high level of calorie burn. If you’re like Sandy, then increasing the amount and quality of your exercise is going to help your body learn how to burn calories effectively. If all you do is eat less and less, you’re body still doesn’t know how to burn calories and will therefore just shuttle them into storage when you do eat too much. That’s not a good scenario to be in. So start training and work up to lifting some heavy weights, carrying some heavy objects, running, jumping, etc. If you’re goal is to burn the maximal amount of body fat you need to be very active and move daily. Yes, daily exercises. Three times a week walking for an hour isn’t going to burn enough calories for Sandy to reach her goal. She’s going to have to hustle and burn off tons of calories each week, since 18.5 lbs of body fat effectively converts to about 64,750 Calories. That’s 190 McDonald’s bacon cheeseburgers or about 68 hours of continuous running at a 6 mph pace. So the real difference between fitness and health has to do with your goals. You can still be healthy and eat a healthy diet and still be gaining body fat. It has to do with what type of calories you’re eating, how many calories you’re eating and what those calories are composed of which we’ll get into more in part II. What’s really important to remember is control your hunger with a good mix of protein and fat in your diet, eat moderately and exercise a lot. Just realize just because you’re eating “healthy” doesn’t mean you’re eating to lose body fat. Remember the difference. Indeed. I really (really) could use more exercise as my fitness is not nearly where it should be. I feel better when I am more active, but motivation is lacking. The fact that I am a naturally thin person does not help with motivation. I may look thin, but I am not dong my body any good with inactivity. Must change that! Very informative. I clearly have a lot to learn! Ah, man. Just when you think you’re starting to figure it out! Doesn’t help to have all the fads out there either. Interesting. Well written and so true. Thank you for the refresher ! You’re really great at explaining things clearly! I have yet to meet anyone that could not be more fit in some aspect, whether it’s mental, physical or spiritual. Ideally you need to find the right mix that helps you keep motivated year long. And realize that this will change over time. There’s always more to learn, however, the fads and gimmicks are everywhere with someone trying to make a quick buck. It’s easy to get mislead and there really are a million ways to attain an ideal fitness level. Only time and experience is able to pinpoint which is the best route to take. Thank you very much! I pride myself in trying to explain complicated things in a very easy to understand fashion. Although I can be a bit wordy. I think I have a balanced health and fitness in life. I try to anyways, although I should probably amp up the fitness part, considering I have slowed down alot from what I used to do. This is such great info. I have friends who misunderstand the relation between the yoyo diet they do once or twice a year. And they try to eat everything low fat and don’t eat much protein to try and lose weight. Frustrating to watch people make poor choice. Interesting,sure gives me a lot to think about !